Though a new certification program which equates quality repairs with following OEM procedures (if not necessarily specific OEM equipment brands) rather than indirect factors like KPIs is an admirable concept, the pedigrees of its developers and auditors might make some shops and automakers wary. Careers of parties involved in the certification program’s protocol and execution include the kind of industries automakers and some shops have criticized as bad for drivers: insurers and aftermarket manufacturers. The panel creating the NSF protocol also includes members with history in the controversial collision repairer MSO subset. “As an internationally recognized developer of more than 90 public health and safety standards, NSF International’s role is to convene world class experts in a given field and facilitate the development of the protocols and standards by which certification is offered,” Frayer said in a statement. 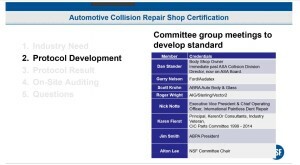 “Specific to the development of the Automotive Collision Repair Shop Certification protocol, the inter-industry experts who served on the NSF technical committee have well over 130 years of combined collision industry experience in the areas of collision repair, training (I-CAR) and standard development. “For over 70 years, NSF International has been facilitating the development of standards, conducting audits, providing training and education programs for a wide range of products for the automotive, food, water and consumer goods industries to minimize adverse health and safety effects and protect the environment (nsf.org). NSF is committed to protecting human health and safety worldwide. Karen Fierst, KerenOr Consultants principal: Also correspondent, BodyShop News, 2014-present; columnist, Motor China Magazine; National Auto Body Council board member, treasurer, and project chair-co/chair, 2004-14 (treasurer 2007-10); Taiwan Auto Body Parts Association U.S. liaison 1999-present; Certified Automotive Parts Association deputy executive director, 1989-97. Also a teacher, community organizer, customer representative on Ford Consumer Appeals Board, ASTM International Committee for Bunk Bed Safety and Consumer Federation of America lobbyist for automotive issues. Scott Krohn, executive vice president of operations for ABRA: Also, general manager of repair center, franchise district manager, Minnesota operations manager, Tennessee operations manager and vice president, regional vice president, senior vice president of operations, 1996-2009. Alton Lee, automotive certification business unit manager, NSF: Owens-Illinois finished products manager, quality manager and assistant quality manager, SAP Central Region lead (software introduction), project engineer, 2009-14. Roger Wright, founder of Vector Squared: Also vice president of operations, Sterling Autobody Centers (then under Allstate), 2009-14; vice president of claims, AIG, 2003-2009; CARSTAR senior vice president, 2000-03; director of insurance relations, Collision Team of America, 1997-2000; Integon GMAC Insurance assistant vice president of claims, 1994-97. Nick Notte, International Paintless Dent Repair chief operating officer: Also new I-CAR finance/operations director; president of Sterling Autobody Centers (still under Allstate), 2009-14; Allstate director of auto claims, 2007-08; sales director of Nobilas North America under Akzo Nobel, 2005-07. Jim Smith, president, Automotive Body Parts Association: Also owner, JSC Group, 2007-present; NSF consultant-insurance industry relations, 2009-13; LKQ regional manager, 2004-07; operations manager, industry relations manager, Midwest Fender/Action Crash Parts, 1998-2004. Doug Irish, president and CEO, Accuracy Driven4: Also president, VeriFacts, 2012-14; MetLife claim technical development administrator, claim technical administrator, material damage specialist supervisor, field appraiser 1993-2001, 2005-12; Army specialist, 1979-82. Audie Swedeen, executive vice president and chief operating officer, AccuracyDriven4: Also independent multi-lines/catastrophe adjuster, Pilot Catastrophe Service, 2008-14; VeriFacts director of operations, 2009-14; I-CAR director of qualification testing, 1994-07.